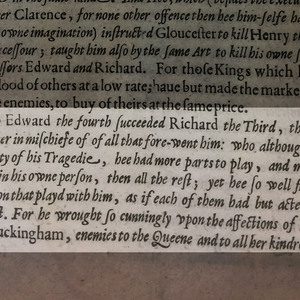 Excerpt from the Preface to Sir Walter Ralegh's History of the World that demonstrates his use of theatrical language when describing the Reign of Richard III. 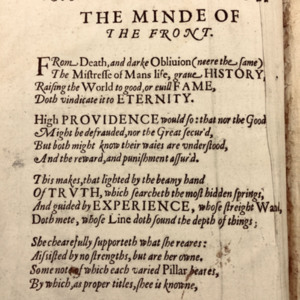 Ben Jonson's explanatory poem to Renold Elstracke's frontispiece in Sir Walter Ralegh's History of the World. Poem concerns Ciceronian teachings and iconography. 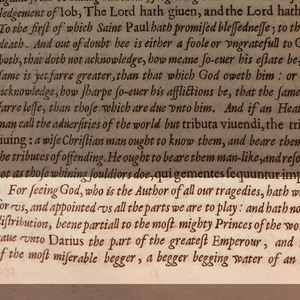 Excerpts from the Preface to Sir Walter Ralegh's History of The World exemplifying his use of theatrical language. 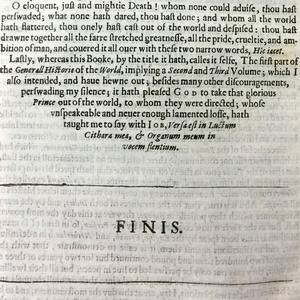 Final page of George Sewell's Sir Walter Raleigh, A Tragedy containing Walter Raleigh's final speech. 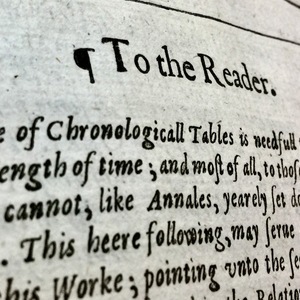 Header of the "To the Reader" section of Sir Walter Ralegh's History of the World. 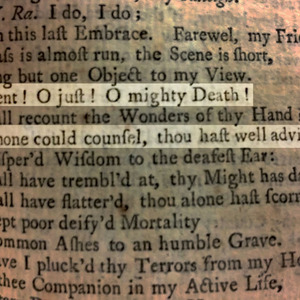 Printed on folio-sized, rag-based paper.